Due out for the PC version in September. Shovel Knight will join fighting game Rivals of Aether as a playable character, developer Dan Fornace announced. Due out for the PC version in September as a $4.99 downloadable add-on, the Shovel Knight content will also include the Troupple Pond stage from his game. Shovel Knight comes with a huge array of tools from his game and puts them all to use in Rivals of Aether. His attacks knock gems out of his opponents which he can collect to increase his treasure. By taunting, Shovel Knight can summon Chester and spend his treasure on upgrades. This allows players to customize each fight to their needs and experience even more of Shovel Knight’s abilities. We are incredibly excited to bring such a well-known and beloved character to Rivals of Aether. We are even more excited about the unique playstyle that he brings to the table. Many of his attacks seem simple on first glance but have intricacies in how you can use them, similar to his abilities in his own game. 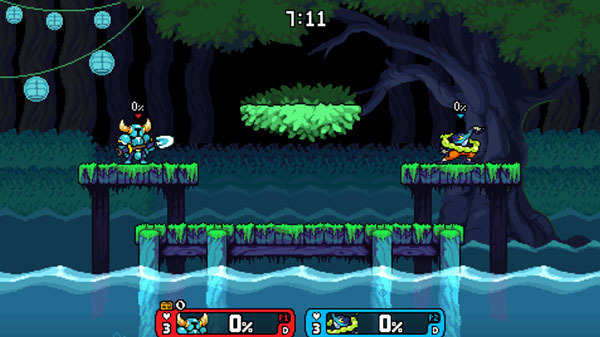 Shovel Knight’s signature Shovel Drop is a big part of his game plan in Rivals of Aether and sets up for his combos. Rivals of Aether is available now for Xbox One and PC. According to today’s update, a “Definitive Edition” featuring all the characters, more online features, and Abyss Mode customizations is coming to PC in 2019, and more platforms are also planned.